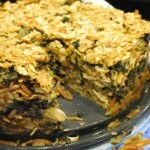 The ingredients are split into filling or the middle layer, and crust or the top and bottom layer. You will need 3 pounds of ground chuck meat in total. 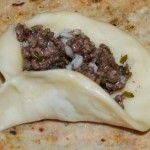 It is always a dilemma whether to list the total amount of an ingredient for the entire dish as one measurement, or list the quantity separately for the various components, as I do in this recipe, so you don’t wind up sautéing the whole three pounds of ground beef for the filling. Read the directions before you start this dish, it is a little different conceptually. Preheat a large (12 inch) sauté pan. 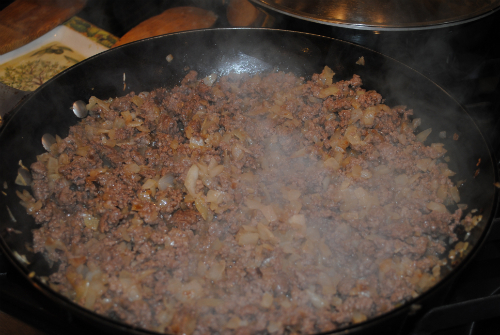 Add the oil when the pan is hot, lower the temperature to medium, and then add the chopped onions. Slowly sauté the onions until sweet and translucent then add the ground chuck and sauté until well browned on a higher heat. Season the ground meat with the spices, pine nuts, and walnuts. Feel free to adjust the seasoning. Stir and set aside to cool off. The meat should be broken up in to fine crumbles. 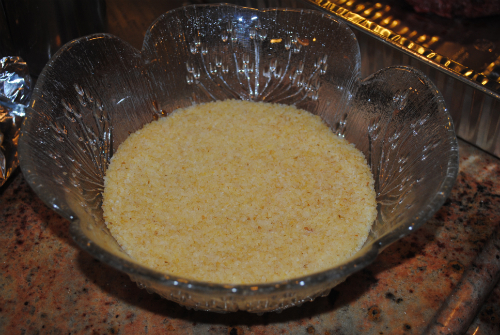 Next for the crust, place the bulgur in a bowl and cover it with water. Let the bulgur sit for 20 minutes while it absorbs water. 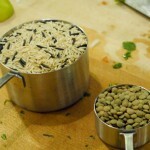 Using your hands, squeeze all liquid out of the bulgur and place it in a large food processor work bowl. 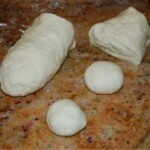 Add in all the other ingredients and process until the bulgur resembles dough. You may have to process in two batches depending on the size of your processor or what I prefer is to grind everything except the ground chuck together. 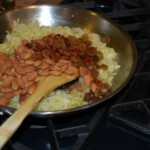 I place the ground bulgur in a larger bowl, add the ground chuck to it, and blend it altogether with my gloved hands. 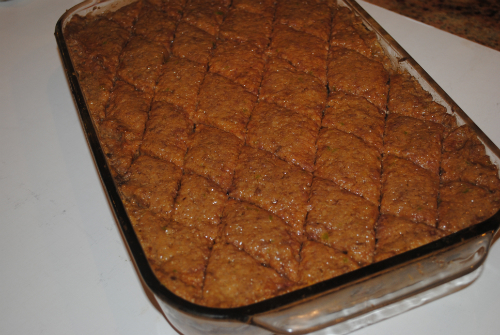 To assemble the Kibbeh, grease a large glass rectangular baking dish with oil (9 x13). Spread 1/2 of the crust mixture evenly over the bottom. Spread the cooked and cooled filling on top. 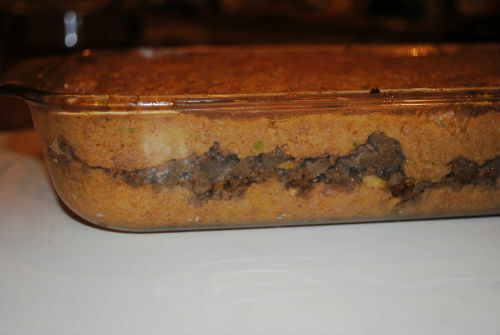 Spread the remaining crust portion on top of the filling, as it is a third layer. Refrigerate one hour until the Kibbeh stiffens. The Kibbeh is easier to precut when it is stiff. Using a sharp knife, precut diamond shaped servings, about 1 and1/2 inches to 2 inches in size. Brush the top of the Kibbeh with a couple drops of oil and bake in a preheated oven set at 350º for one half hour. Then turn down the temperature and bake for another half hour at 325 ° or until golden in color and cooked through. I often bake this dish ahead for holidays or parties and I freeze it for a couple of weeks before my event. I freeze it in the baking dish tightly wrapped in heavy duty foil. It is a wonderful side dish or starter, served with a dollop of hummus. Thanks so much for posting this. I have been looking forward to getting the recipe and will definitely be giving it a try very soon. Looks just beautiful cut into the diamonds.